Step 1 Combine soy sauce, maple syrup, olive oil, and liquid smoke in a small bowl to form marinade. Step 2 Coat mushrooms with marinade and allow to rest for 10 minutes. 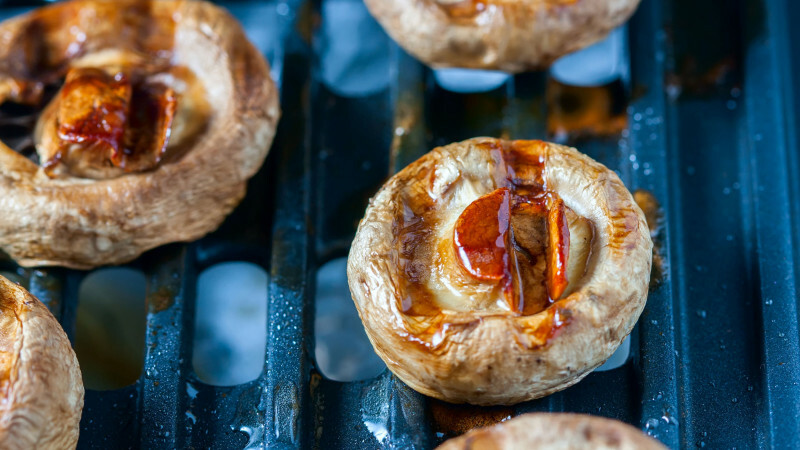 Step 3 Preheat grill pan or grill, and grill mushrooms for two to three minutes per side, or until grill marks appear. Step 4 Mince jalapeno and add to mayo. Step 5 To assemble, place grilled portobello on bun followed by arugula and jalapeno mayo. Serve warm. Nothing is more of a barbecue Opens a New Window. killjoy than expecting pescatarians or vegetarians to slop a sad, pea-studded veggie patty between a bun. It doesn’t have to be this way. Whether you’re trying to eat less beef Opens a New Window. or simply dig mushrooms, this satisfying grilled recipe Opens a New Window. is a cinch to pull off. Chef Instructor Olivia Roszkowski at New York City’s Natural Gourmet Institute —the only nationally-accredited, health-supportive culinary school — has a remedy for any veggie burger-related woes: Take a Portobello mushroom and marinate it in an umami-spiked sauce.